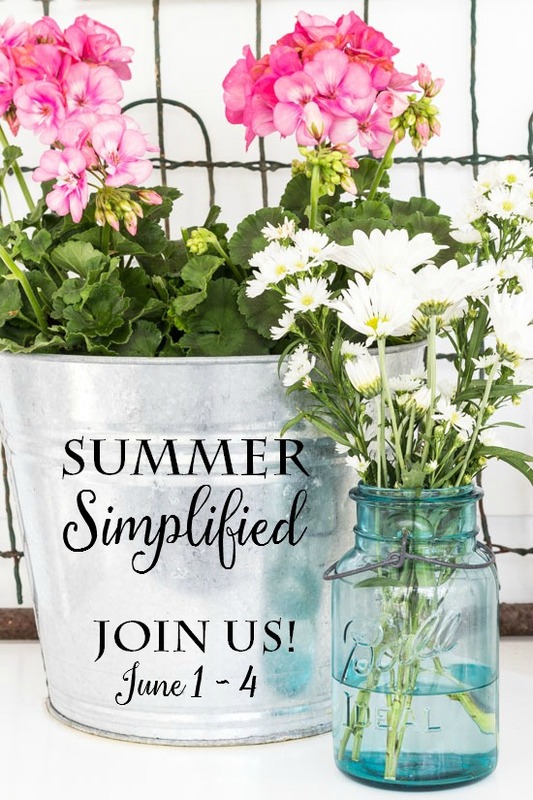 Summer is all about the outdoors whether it's working in the yard, gardening, swimming or hanging out on a deck or patio and we want to live a bit simpler and a bit more laid back this time of year. Today I am joining a group of bloggers to share some simple tips for outdoor living. We are certainly enjoying the outdoors more since making over our deck last summer. I've made just a few little changes from the way I had the seating area decorated so I'm going to show you how it looks now and share a couple of things I do to make things easier when entertaining out here with one cheap item. I thought I would share this shot first with my assistant in it. She loves to hang out with me out here. One of the first things you will notice that changed is the hanging shutters have been replaced with a tobacco basket. The shutters were already old and in poor condition and I guess gravity just made them start coming apart so they had to come down. I have had this potting shed sign for years and decided to attach it to the tobacco basket. For a change I replaced the green rug with a blue one since blue is my go to color this year. The pillows are the same with a couple of new ones thrown in incorporating more blue. For easy entertaining I like to fill a large bucket with drinks and keep them close by. I found this one at HomeGoods for under twenty dollars. That's tip number one. Where are my manners? Grab a cold drink. One is black cherry and the other is orange soda mixed with prosecco. I hung my vintage trapper's basket and stuck a hanging basket I had in it. I just pushed the wires down so they don't show. I can just take it out and hang it again when ready. The pink lanterns that we had hanging from the pergola were just too hard to light so we took them down. Plus candles can't sit outside anymore in the heat that came rolling in because they melt. And the best time out here is either early morning or after dark. And tip number two: To make setting the table outdoors quicker I like to fill the bucket with the essentials and then carry the bucket out to the table and start setting it. It may take two bucket loads, but two trips is much better than several in and out. Oh, and you are getting a peek at my red,white and blue items I have been gathering to use around July 4th. 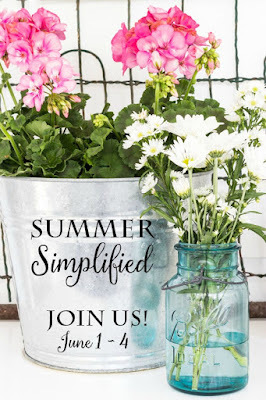 Be sure to check out the bloggers below for more summer simplified ideas. Can you tell me the color of your deck? Went back through your past blogs but I cannot find anything about the color. We are in the process of repairing and replacing some of our deck planks and giving it a fresh coat of color. We used Behr Premium solid color Weather Proofing all in one wood stain and sealer in the color Chocolate which is one of the standard colors. the porch just looks amazing. i bet you are so thrilled to have such a beautiful outdoor space. Thanks my friend. Come on over! Love your outdoor space! So pretty! Thanks Debbie, I love yours, too! Always love seeing your beautiful deck...so happy that your dreams came true and you now have a gorgeous deck with pergola to enjoy!! !...A gorgeous selection of fabulous pillows!!! Your bucket is pretty and a nice big size. And I love that you use it in multiple ways! We gave a huge July 4 party for several years and filled two baby pools with ice for drinks. Our guests were amazed by it--you can't buy giant bags of ice here. Supermarkets sell dainty little two-liter bags of cubes for a fortune. I luckily have a gym buddy who works at a warehouse that uses American-size bags. Otherwise it would have mean weeks (months?) of making ice cubes! What a cool idea using baby pools!! Beautiful, Kim! Your deck looks so great with the addition of the pergola and all that cozy seating and cushions. Love it all! I do the same thing with my outdoor seating and use a huge tarp to cover it all. It works out great and helps keep it nice longer. I'm with you, I wish we had that lower humidity back, the heat is already wearing me out! Happy summer to you! Good idea re the basket in the trapper's basket. I pot alot of my own hanging baskets but I always disguise those plastic hanging baskets. I have some I just sit inside the nice wire baskets with coco liners. Since you love pillows so, do you ever read "Dimples and Tangles" blog? She is the BEST at mixing pillows - colors, patterns, etc. and she has some great outdoor pillows shown today. So pretty and such a great space to enjoy the outdoors. Your back deck and pergola look so relaxing! Thanks Penny! It is especially after dark. I'll take the orange soda and Prosecco please! :) Kim, your porch is amazing - I have some serious envy over your sofa and I love your tobacco and trapper's baskets! One orange soda and Prosecco coming up! Absolutely wonderful, Kim. I know you must be loving this new space. Thanks Stacey, I sure am. Getting hot now though. I think this space is perfect. Colorful, welcoming and cozy. My favorite thing is the trapper's basket. Brilliant! Your deck is so beautiful, Kim. I am so happy for you that Mr. Savvy built the pergola and you all can enjoy your outdoor space again! Love the mix of pillows!! Absolutely love this space, it looks so welcoming, I could happily sit there for hours! The weather her has been awful the past week here in France, all the locals are complaining it's the worst May since 1993! It is meant to all change tomorrow, fingers crossed, I cannot wait to get back outside to outdoor living again and this blog post has made me want to even more! Your deck is beautiful with all the pretty colours and comfortable spots to sit and unwind. Love this Kim - I'll be right over for a drink! What kind of outdoor lights do you string? I've bought a couple different kinds, but the little bulbs end up breaking while I'm hanging them or from a strong breeze. I was also wondering about the rain and if it hurt the rug, etc. but guess putting a tarp on solves the problem....except if you're not at home when the rain starts. Love the way your porch has turned out! It's morphing into quite a space for you and your husband (and family) to enjoy! The colors all look great together too! Btw, for my drink, I'll take a lil' bit of what's in the big bottle:D Have a great weekend, Kim! I actually left my cushions out in the rain last night...ugh. I love everything you have done with your deck. It really has turned into another room for you. I am glad you (and your assistant) are enjoying it! Your deck is gorgeous! I love all the lights for the evening so enchanting!! The blue rug is perfect out there! I love the look paired with your pretty colors on the pillows. I know you are enjoying it so much. I bet you enjoy having this outdoor space Kim! It looks beautiful and Bailey looks happy too..we all know that is what matters most lol! Love it all Kim! How do you store all your pillows? Getting a pile of magazines & coming right over Kim! So inviting!! So clever to tarp your decor and furniture Kim! Love your decor - such a welcoming and cozy spot!